Photo by Reg Madison Photography, courtesy of The Phoenix Theatre Company. FROM THE PUBLISHER Congratulations to the 2018-19 Arts Heroes! These outstanding individuals were selected based on their involvement with and commitment to making the arts and culture in the community flourish….thus their red capes on our cover. These individuals are heroically dedicated to the work they do and we want to applaud their efforts. The heroes stance on our cover art is indicative of their strength and focused commitment that helps propel the arts community forward. The 2018-19 Arts Heroes join the 18 heroes chosen the three seasons prior; the program launched in 2016. ON Media is committed to the arts and businesses of the community, recognizing you cannot have one without the other. The heroes make it all happen. We applaud Salt River Project, sponsor of the Arts Hero program. They believe in the program, the arts and the health of the community. Thank you, SRP! As you read through this collection of hero stories from the past season, you will note one quality they all have in common: Each is passionate about the role she or he plays. 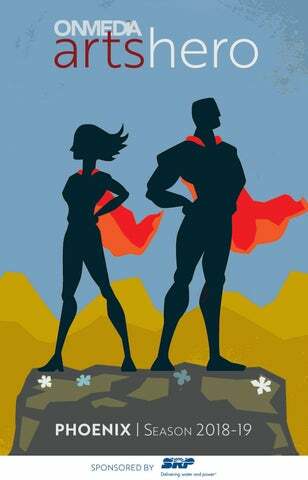 Think about the Arts Heroes in your world and nominate a 2019-20 candidate at onmediaaz.com/arts-hero. 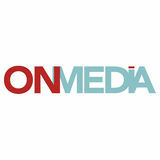 For advertising inquiries, please send us a note at sales@onmediaaz.com. The best way to see where Laing is going is to follow his thoughts about classical music, community and being true to himself. Laing’s practice is now regularly honored and elevated. Laing has done more than found his way. He leads. Do you know an Arts Hero? Someone who works tirelessly to strengthen, improve and enhance the arts in our community? Empowering the community through arts and culture. Top 30 “Movers & Shapers” of classical music. In April, he played Carnegie Hall in an ensemble performance accompanying tenor Lawrence Brownlee in “Cycles of My Being.” Laing, who serves on the board of the Arizona School for the Arts, says this incredible journey doesn’t happen without the Phoenix Symphony Orchestra. It gave him space to be the artist he wants to be, including founder of a local nonprofit, The Leading Tone, that uses music instruction in an after-school setting to advance youth development. Never center stage but always at the center Obviously, there’s more to a theatrical production than what actors do on stage. Lights and sound don’t run themselves. Hidden effort moves pieces of scenery. Someone calls cues. Glenn Bruner, longtime production stage manager at Arizona Theatre Company, controls the obvious. On his best days, no one in the audience knows that. His work goes unnoticed, and that’s fine with him. conduit between what’s happening in the rehearsal hall and the rest of the organization. During a performance, he runs the show. It’s his job to maintain the intention of the directors and designers. DOUBLE DUTY But Bruner is unlike most production stage managers because he has mastered the unique ATC challenge of managing plays in two cities. ATC will do six plays this season and will perform each one in Tucson and Phoenix. The Texas native is in his 22nd season as a behind-the-scenes fixture at ATC. He is honored here for all of the obvious reasons. ‘Simple guy’ loves grand spirit of the West “I’m just a simple guy off the farm in Iowa. That’s my story and I’m sticking to it.” Jim Bruner quietly and confidently speaks his truth. There is, and always has been, a humble man behind his long list of Valley accomplishments. NOT-SO-SIMPLE He is just a simple guy who collects model trains, enjoys Big Band music and loves, with an infectious passion, the West. There is a special spirit and openness here that’s so grand, he says, that anyone who is determined and has good intentions can succeed. For nearly 50 years, Bruner has succeeded in building up the Valley through volunteerism and elected office. He is a key reason the Arizona Diamondbacks have a home in downtown Phoenix; he is a founding board member of the Scottsdale Cultural Council (now Scottsdale Arts); he has served numerous nonprofits, including the Phoenix Symphony Orchestra. LEADER OF THE PACK One project – Western Spirit: Scottsdale Museum of the West – has Jim Bruner written all over it. Director and CEO Mike Fox says the museum is the epitome of Bruner’s hard work and voluntary service. “As trite as it might sound, but as truly genuine a statement as I can make, there would be no museum today if Jim Bruner hadn’t been the leader of the pack,” Fox says. Museum of the West opened in 2015. It quickly landed on “Best of” lists and earned the Smithsonian Affiliate distinction. “Twelve years ago, we had no art, we had no donors, we had no money,” Bruner says. “We just had an idea and a dream.” And the Western spirit of a simple guy from Iowa. GEORG STANGELBERGER A hero takes a bow Georg Stangelberger, artistic director of Phoenix Boys Choir, has spent much of 2018 packing up 20 years of Arizona memories in preparation for a triumphant return to his native Austria. special place in his cargo of Arizona memories. The historic building looked its worst when Phoenix city officials asked Stangelberger to consider its potential. The first thing he noticed was “lots of pigeon dirt,” he says, parting his hands to a depth of about a foot. But then he saw the wood floors, tin roof and hard walls, and knew it would be a good venue. He’s proud of his role in the 2006 bond election that included hall renovations. “It’s a treasure for Phoenix,” Stangelberger says. “It’s one of the best acoustic places we have for chamber music and for choir music.” Thank you, Maestro, for leaving so much behind. 80,000 square feet of comfortable living space Kathleen Dooner is big on family. Really big. As in, she feels like everyone is part of her family. Finding the intersection of arts and culture Rachel Egboro directs traffic at the intersection of arts and culture, where she helps people make connections. There’s quite a story behind that. A dancer with a passion to teach Frances Smith Cohen’s life as a dancer was preordained. Her father, who was exceptionally smooth on the ballroom floor, declared that if he ever had a daughter, she would be a dancer. But Cohen’s 75 years of teaching dance to young children? That’s all her. It’s a passion that likely sparked when she was 4 and soaking in thunderous applause on a stage in Newark, New Jersey. It still burns bright at 87. THE TEACHER Cohen, co-founder in 1972 of the dance program at the University of Arizona, is one of the state’s first champions of modern dance. She currently wears leadership hats at Center Dance Ensemble, Dance Theater West and Wolf Trap, an artsintegrated, early-childhood-learning program. In an exceptional life of dance, teaching young children is one of Cohen’s greatest gifts to Arizona. “We relate,” Cohen says. “They just make me laugh. Even at this age, I have an incredible affinity with them.” She was 5 when her family moved to Tucson. At 12, she was teaching dance classes for 4-year-olds in lieu of paying her instructor. Stand-up comedy enjoys a boom Early in her stand-up comedy career, a shy, reserved Genevieve Rice received good advice about stage fright: She should channel all that nervous energy onto the stage and into the art form. Rice burst out of her shell. Now, as a performer and as a producer of the Bird City Comedy Festival, she’s a bright light in the Phoenix comedy scene. COMEDY BOOM The native Oklahoman says she grew up in the comedy boom of the late 1980s and early 1990s. She believes another boom is happening now. The comedy scene in Phoenix is larger and more robust than when she arrived in 2007. What she saw here was similar to what she saw doing stand-up in Oklahoma City: limited opportunities to take the mic and few women and people of color on stage. Rice is happy to see diversity and growth in Phoenix comedy, but she is humble about her role in the change. In just three years, Bird City became a major Arizona celebration and elevation of comic talent. Last year, Vulture magazine put it on its “Best of” list. In addition to the festival and performing, she co-produces the monthly “Jazz and Jokes” show at The Nash. She’s a renowned artist, but some of her best work isn’t on canvas Beth Ames Swartz’s long, big career as an artist is chronicled in multiple, multi-year series of visual works exploring human connections. Not all of her work, however, is on canvas. In the community where she loves to do good, a Swartz masterpiece 20 years in the making, the Artist’s Breakfast Club, has no end in sight. The “show would not go on” without the incredible support and dedication of those who champion the arts—behind the scenes, in the box office and in communities across Arizona. Arts Heroes are selected monthly throughout the performing arts season and be featured in ON Media programs, which are seen by more than 3 million arts patrons in Arizona -- allowing individuals to tell their incredible stories, so others can applaud their hard work in the arts.